We all deserve to treat ourselves every now and then, and when I say “treat yourself”, I mean indulge in life’s finest desserts. Not sure what makes macarons so tantalizing— maybe it’s the jewel tone colors, the decadent fillings or the fact that the most romantic city (aka Paris) has perfected them. My take on this elegant dessert involves raspberries, Swiss meringue buttercream, and Slo Food Group’s edible gold— can you say luxe?! Check out the below ways you can incorporate edible gold into your next dessert! 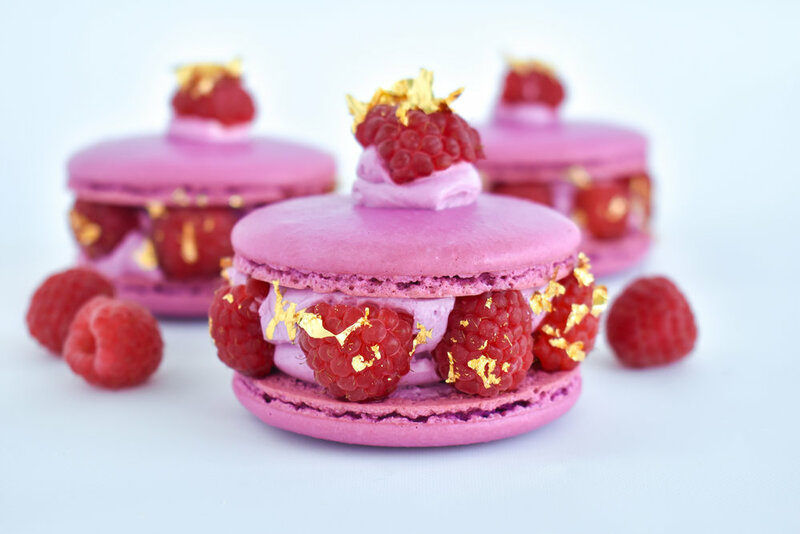 Decorative Details- A great way to use gold is as a decorative detail like in these raspberry macarons. They are easy to apply by just using some kitchen tweezers and draping over fruit, macarons, cakes— anything you name it! You can see how to apply the gold in my video located in my Instagram’s IGTV. Luxe Linings- Geode cakes continue to be a very popular trend and also an excellent way to incorporate gold! Use the gold leaf to accentuate the geode outline on your next cakes, macarons, etc.! The possibilities are endless! Coveted coatings- Gold leaf is also a perfect covering to your delicious cake pops! An elegant touch to spruce up your cake pops for weddings, parties, you name it! Click the picture above to start ordering your gold leaf from SloFoodGroup today- trust it me it will not disappoint! The macaron (or “Macs” as I call them) can be a tricky dessert to make. I mean even the name itself can be tricky to say, so they get a bad rap if you know what I mean. Most people steer clear of making these little devils, and I have seen more times that I can count that people are SCARED to make them (WHAT?!) Have no fear, you are not alone! I’ve been through hell and back with these cookies, and I can confidently say that there is a light at the end of the tunnel! Tip 1: If the tops of your macarons are cracking, it is probably because the batter is overmixed and there are too many air bubbles. Try to whip the egg whites until just stiff peaks. A trick I learned is if you tip the bowl slightly to the side and see the batter sliding, it is not stiff enough. The batter should not move at all once tipped to side. Also, make sure you oven is not too hot. It can make the macarons rise too fast causing cracks. Tip 4: Sticky bottoms/sticking to mat is because the macarons have not cooked long enough. Try leaving them in for an additional 2-3 mins so that they will easily pull off. Tip 5: Cool macarons upside down. I know this sounds weird, but after taking out of oven, let them cool for about a 30 secs-1 minute before flipping them upside. Gravity can help close that little gap at the top! Ohh pistachios! Such a versatile nut that can take so many desserts to an elevated level. Whether it’s ice cream to buttercream, pistachios have a way of making your tastebuds crave more and more. With pistachio’s growing popularity, it is only natural that one of my most requested macaron flavors is pistachio! I received so many requests for this recipe that I wanted to share so you can enjoy this delectable treat in the comfort of your own home. When at your desired sweetness level, slowly add in pistachio paste (continue to add a tsp at a time for strong flavor). Then add in food coloring if desired. Let me know how it comes out by tagging me in your creations! These “Nutter Butter” macarons are like a dessert time machine back to grade school days. I used to love when my mom would surprise me and put one of the snack packs into my lunch. Ever since I was young, I have a been a HUGE peanut butter fan! Like eat it “straight out of the jar” fan. Beat egg whites in a large bowl with hand mixer on low speed. I prefer a hand mixer because it is a lot easier to control and see when the egg whites are reaching stiff peaks. The more you can keep an eye and see the texture of the egg whites, the less likely you will over whip the whites. Once the egg whites start to leave trails with the beaters, slowly add in the sugar. I usually pour half slowly and beat. Then pour the rest until fully incorporated. Slowly add in flour mixture a 1/3 at a time into the egg whites. Make sure to fold until flour is incorporated after each third. Nothing says Fall like a good caramel apple! And nothing says “perfect treat” like a caramel apple in MACARON form :) Naturally, I wanted to combine two of my favorite things, and share the goodness with you all. 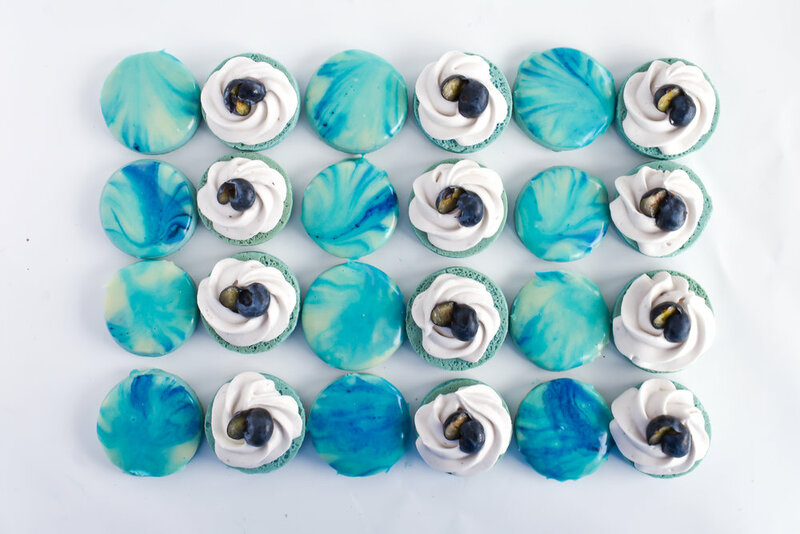 This macaron is a delicious bite size treat which is great because they’re so good you can’t just have one! Mix in pinch of salt! Pour in heat safe container and can keep in fridge for later! Once all filling items are complete, pipe buttercream around the edges and fill center with homemade caramel. Sprinkle with small, chopped pieces of apple over caramel if desired. Garnish with caramel and slices of apple for a finished touch! Now you can have it any day of the week too, just follow the simple directions below and you will be in this ooey, gooey Mississippi mud pie heaven in no time! Bananas. Chocolate. Cookies. An amazing combination that is totally underrated! Growing up, my mom would always make banana chocolate chip muffins so I wanted to try recreating that memory into a delectable cookie! Preheat oven to 400 degrees F. Line baking sheets with parchment paper. Sift the flour, baking powder, salt, and baking soda together, and set aside. Bake in preheated oven for 12 to 15 minutes. I start to check after 10 mins as my oven can get hot fairly quickly! I took a break from macarons this week to bring you this ah-maze-ing mango pie that will beat all other summer desserts. The secret is that it is SUPER easy, but will impress all your friends in no time! It is the perfect blend because the cream cheese & yogurt base helps balance out the sweetness from the mangos and oranges. 4. Transfer to medium bowl and drizzle ice water starting with 4 tbsp. Continue to use a rubber spatula by pressing the dough in itself. If dough still crumbles when pinched, continue to add 1 tbsp of ice water at a time. 6. Once dough has firmed, let it sit for 5 mins so it is easier to roll out. Lightly sprinkle flour on surface, top of dough, and rolling pin before rolling out. Continue to lightly sprinkle if dough is sticking to rolling pin, counter, etc. 9. Pierce the bottom with a fork to prevent air bubbles. Line crust with two sheets of aluminum foil and push it against across whole pie surface. Then, fill foil with dried rice or pie weights. 10. Refrigerate dough for at least 30 mins while oven preheats to 425F. Place a baking sheet in middle rack while oven preheats. Hope you all enjoy and have a happy summer! This is the EASIEST dessert that you can quickly throw together for a potluck, kid's birthday party, whatever you name it! It is the perfect balance of sweet and salty that you might as well call them crack bars ;) They only require a few common household ingredients, and you will have a extravegant dessert in minutes! Step 1: Start with Graham Cracker Base. Mash up enough graham crackers to cover the bottom of a small baking dish (similar to brownie size pan). Getting tired of boring strawberry ice cream? This version will take your taste buds and summer treat to the next level! It might require a little extra work being homemade, but the taste is incomparable. The fresh taste of strawberries and cream is something you can be proud of serving at your next dinner party! 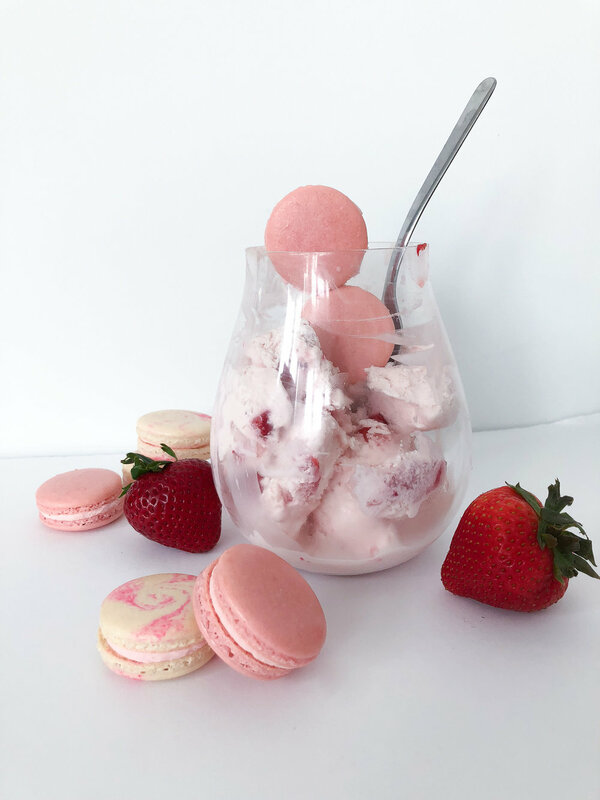 Check out my rose macaron post for the perfect pairing to this ice cream!